This guide is dedicated to the creation of simple two-node HA cluster and iSCSI target setup with ZFS as storage basement. 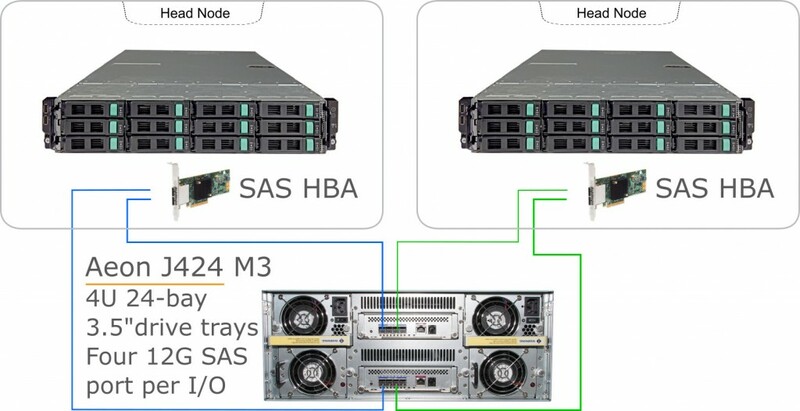 Most common HW for such solution – two servers and one JBOD with SAS HBA connection. A similar system can be built on Cluster-in-a-box class system – two servers with JBOD in one enclosure like we mention in the article about Shared DAS. Such system serves as SUT (system under test) for this article. Hardware failure resistance is provided by redundant components: two or more servers, fault-tolerant JBOD, redundant SAS (multipath) and networking links. OS-level multipath is provided by the multipathd daemon. Ethernet links are combined with bonding/teaming. Storage redundancy is based on ZFS. ZFS also manage volumes and caching. corosync+pacemaker – infrastructure to setup HA-cluster and resource management. NOTE: All steps must be performed on both nodes. Install GNU/Linus OS with OpenSSH on both nodes. This article provides a guide for RedHat 7, suitable for CentOS 7 and will work (with minor difference) on all other modern GNU/Linux distributions. enp130s0 — internal. Used only for corosync service purpose. Interface bonding is done via Team. If you connect block device to SAS HBA card with more than single path (like in CiB with dual expander access) – you will have have double count in OS dev list. To work right we need multipathd daemon. ZFS is used as alternative to MD+LVM pack. It decrease resource variety for heartbeat and simplify management. You can organize block access (iSCSI/FC) or file access (NFS), use SSD cache and dedupe function without additional tools and control from cluster side. After deployment you need to create drive pool and volume. Pool is exported.